After Coconuts blasted himself- with his pieces delivered as a gift- Scratch and his non-identical twin brother Grounder had the task of stopping Sonic. They would have succeeded had they not got into an argument, during which time, Sonic left them buried. Scratch and Grounder, along with Coconuts, later appeared at a villians' tryouts, with predictable results. 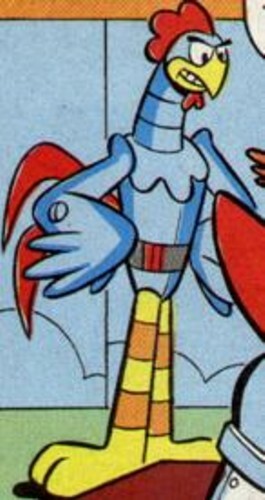 Scratch, but not Grounder, later appeared at a company picnic to celebrate Robotnik's return from hiding following the Universalamander fiasco. During another ill fated attempt at stopping the Freedom Fighters, Coconuts explained that Scratch was able to last, at longest, 16 seconds against Sonic. Grounder and Bat Brain both lasted longer. Scratch and Grounder, along with Coconuts, returned much later as employees in Mammoth Mogul's newly renovated Casino Night Zone. Scratch has a job as the concierge, while Grounder appears to be a chef. Both, along with butler Coconuts, had developed a fear of Sonic, a complete lack of respect for the Destructix and a (possibly greater) fear of Amy Rose. Who could blame them?